These are a classic design. They’re well made. Very comfortable for dinner and conversation/hanging out after. We love our new dining chairs! Invite guests into your home with the relaxed, coastal vibe of this chic armchair from Poly and Bark. This chair boasts a solid wood frame with a walnut finish and a woven rope seat that provides contrast and texture. This lovely chair is the perfect complement to Scandinavian or mid-century decor. These were the perfect chairs for my laid back dining room table. The seats are comfortable, and the back and arms give support that I wanted for my family and guests. They arrive fully assembled. I recommend them highly. These are an amazing replica chair. The seats are woven tightly and the color and grain of wood is beautiful. Mid Century styling at a great price. 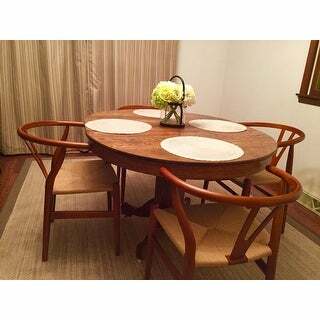 I purchased these chairs to go with a 1960's Danish, teak dining table. They are the perfect companion to my table...wood coloring is a great match and the low back and mid century styling is the look I was going for. Comfortable to sit in for extended periods of time and they are very light and easy to move around which is an extra plus for a home with young kids. I think we will enjoy these chairs for many years to come! Looks like quality construction, sturdy, nice lines, smooth even finish. Walnut color fits in with other finishes. I would have liked a slightly higher back but my fault. Minimalist look and small footprint add seating without bulk. Very happy with it. These chairs are solid and quite comfortable. My only complaint is that the dye/color on the wood is very thin and a slight scratch revealed much lighter-colorded wood underneath. For the price, they are fantastic. 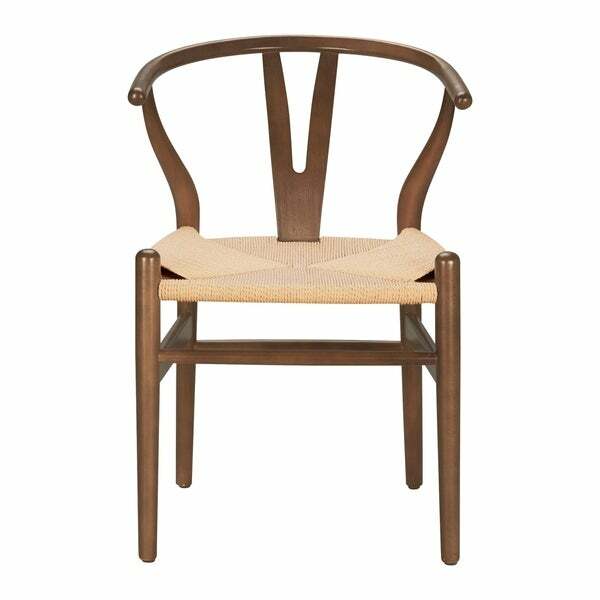 This is a beautiful reproduction of a classic mid-Century chair. It is well-made, and everyone loves it. I have it in a bedroom but a set would be great in a dining room, because they are sturdy but light. I love this chair, well made, nice lines, perfect at my danish table! Be aware that the wood is lighter than it appears online. It's the lightest "walnut" I've ever seen. But the chairs appear to be well constructed. The seat is also a very light color. More of a cream than a beige as it appears in the photo. Unfortunately, this doesn't work for me so I'll be returning them. I have had these chairs for over a year now and I love them. Comfortable and stylish and fit so well with my antique pedestal table. Not too heavy but still sturdy. Really like the uniqueness they give to the dining area. Chair was beautiful but I didn't think the color was accurately represented. They were much lighter in person. Was looking for a more true walnut; returned. always get compliments on this - classic style - not a big chair so there is a limit to the size of person that can use it. I used it as a desk chair at a small desk. Beautiful chairs! Go really well with a table we bought from overstock. They are relatively comfortable. They are light weight and easy to move. Happy with our purchase. Awesome chair. Very sturdy and well made. Shipped in a box will packed. Love these chairs. 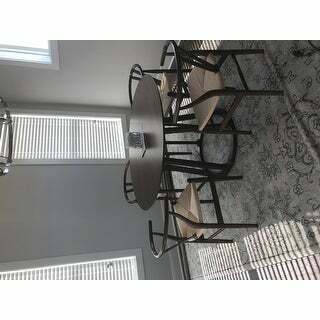 Will be ordering 8 total chairs for my wishbone table. Fast shipping. Great piece and construction, I'm going to buy a whole set for my dining room. "How do I clean liquid stains on the hemp rope seat of the chair?" Pour boiling water over soap flakes (the manufacturer recommends Carl Hanson & Son), using a whisk to make sure all flakes are completely dissolved. Allow mixture to cool slightly then while water is warm, use a soft cloth to gently wipe the paper cord as best you can, making sure you do not get the seat too wet. Wipe the entire surface of the seat, but again, do not drench the material with soap mixture – less is more. Allow to dry and then repeat, if necessary. "When will the black/walnut come back in stock?" Item# 14629950 may be what you are looking for. "What type of wood is this and what is the maximum weight it will take"
Unfortunately, the answer to your question has not yet been received. We will continue researching and provide you with the answer once it is available. "Can I spray the seats with a waterproofing spray to prevent staining,"
This item is made of a natural hemp fiber and will likely absorb rather than be coated by the water proofing spray/liquid. "How many of these are available? I'm trying to order 4, but it's not allowing me to. " Unfortunately these chairs are currently out of stock. If you would like to be notified when they come back into stock, please leave your email address on the product page. "How much weight will it support?" Overstock does not weight test items. We are sorry. "Hi, I just bought 5 of these chairs. I love them but what is the best way to clean the seat?" Hello foodie1, thank you for shopping with us. You can clean hemp with soap and water, rinse well. Have a great day.